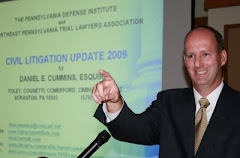 I am pleased and proud to announce that the 2011 Supplement to the Pennsylvania Trial Advocacy Handbook I authored has been released by the George T. Bisel Co., Inc.
On the dedication page, I dedicated this volume "To my good friend, William G. Rice, Esquire (1961-2010)." Anyone who may wish to purchase this treatise may contact the George T. Bisel Co., Inc. at 710 S. Washington Square, Philadelphia, PA 19106-3591, (215) 922-5760, (800) 247-3526, or by email at gbisel@bisel.com. For full disclosure purposes, I note that I am entitled to receive a small royalty for each book sold to a new subscriber.